HE’S TOUGHER THAN A WHIRLPOOL, HITS HARDER THAN A TSUNAMI, AND LIFTS MORE THAN THE WINDS OF A HURRICANE!! IT’S THE BASHER OF BASHERS, THE CRASHER OF CRASHERS, THE BIGGEST OF ALL THE KAHUNAS BEFORE KAHUNAS WERE BIG, STEPPING INTO THE RING IS THE TORRENTIAL MASKED MASTER, IIIIIIIIIIIIIIIIIIIIT’S CRASHERRRRRRRRRRRRRRRRRRRRRRRRRRRRRRRRRRRRRRR WAAAAAAAAAAAAAAAAAAAAAAAAAAAAAAAAAAAAAAAAKE!! Crasher Wake is a Supporter that lets you swap out cards from your hand. Specifically, you can discard up to 2 Water Energy to search out the same number of cards from your deck and add them to your hand. It’s a neat little effect to say the least, but what’s really going to make or break this card is that discard fodder of Water Energy. The thing is, this could end up being an interesting way of getting 2 Water Energy onto your Pokemon with one Supporter. It’s a pretty easy combination too – Crasher Wake retrieves 2 Aqua Patches, bam! Instant two Energy. The real question then becomes whether or not it’s worth the Supporter for the turn. Certainly there are a few good options to target, but you need to make it work for any option you’d use this combination with. Any Pokemon that wants 2-3 Energy on it right away to be good is exactly the Pokemon you need, and as far as Water goes…well, Greninja-GX is probably one of the best options for it right now. It’s certainly not the only way you can use Crasher Wake, and you don’t have to worry about that Water Energy going anywhere unless you’re facing a Fire deck with Lysandre <Prism>. Certainly something to keep in mind! 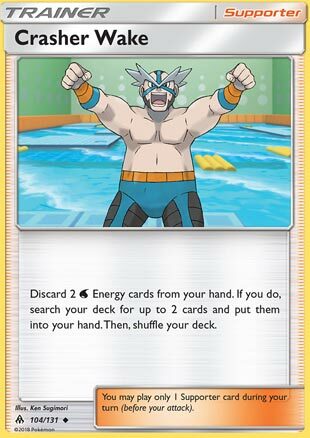 So give the wet water wrestler a whirl in your deck and see how he handles your cards! …that…that could’ve come out better. Weekend Thought: What did you think of this week’s cards? Think they should’ve made the list? Think that Noibat is overrated or underappreciated? What other cards do you expect to see in the coming weeks? Today, we’re looking at Crasher Wake from SM Forbidden Light. Quite odd that he is in a expansion which focused on Kalos and Alola when he is the Gym Leader in Sinnoh region. Anyways, he’s here to help your Water decks gain consistency, as we shall see. Searching your deck for any two cards is amazing. Requiring you to discard two Water energies, however, makes Crasher Wake extremely restricted to a few decks that can make use of it, be a deck with basic Water Energies. Some water decks that see play competitively may include Greninja Break, Alolan Ninetales variants, or in Expanded, Deluge Blastoise. But the problem still remains: the discard cost; you may not have two water energies in hand to meet the requirement that Crasher Wake needs, and you’ve got at least two dead cards in your hand. Crasher Wake (FLI 129) makes a splash in the meta out of the Forbidden Light expansion set. This Supporter card lets you reach into your deck and select any two cards you find there… if you discard two Water energy from your hand. So you have to have two Water Energy in hand to play this card, which I guess isn’t impossible if you’re playing Starmie or Ribombee. I tried it as a one of in my Greninja GX Milotic deck, and I found I rarely was able / had the inclination to use it. That’s quite a cost for only two cards. Granted, you get to hand pick the cards, and it does synergize well with Aqua Patch, but overall I did not care much for this card. I’ll completely agree that that Greninja Milotic deck (aside from not being very good) probably isn’t the right deck to put this card in, but even if you are running a deck that requires a ton of Water Energy, if you have two Energy cards in hand, chances are you’re going to want to attach one of them NOT throw them away. Now, this could eventually be a good way to potentially get two Beast Rings when you need them, but that’s not really an option right now as there aren’t any Water type Ultra Beasts. Yet another card that falls into the category of “Maybe some day.” And that day may be coming around September 1st. We are losing some major draw supporters on that day. However, it is interesting how we’re getting a number of situational draw cards that seem to be more specialized like Crasher Wake. However, post rotation, if you are a fan of maximizing your hand count, it really looks like the Drampa GX turn 1 Big Wheel accompanied by four Cynthia and four Hala is going to be the best way to go.